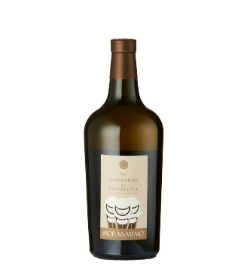 The Mora & Memo Tino Vermentino di Sardinia is straw colour with green tints, brilliant. On the nose it has intense and persistent aromas of scents of flowers and plants, rosemary, thyme and sage. On the palate the flavour is predominantly appealing fruity and vegetal notes, warm and full of good thickness and balanced with a long finish. In making the Mora & Memo Tino Vermentino there is a brief contact with the skins, after cleaning, the must obtained from crushing ferments in stainless steel tanks with the addition of selected yeast at a constant temperature of 15 ° C. After fermentation, the aging on its lees follows for a few months then the wine is ready for the refinement in bottle. The vineyards average 30 years of age with vines planted on a south, south east exposure on limestone and clay hillsides around 200 to 200m above sea level. This is delicious served with seafood in general, fish and delicate meat served with light sauces, soups or pasta.